« Two Is Better Then One, Right? 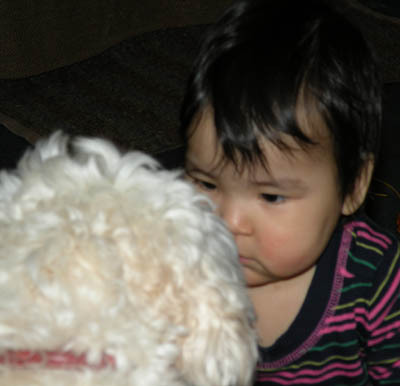 Dagny from the very start didn’t mind Lily very much. Which is great because, Lily could be… well how should I put it… very excited. She is the sweetest dog around. She wouldn’t hurt a fly, OK perhaps a fly but only if it was in her face, but wouldn’t you? 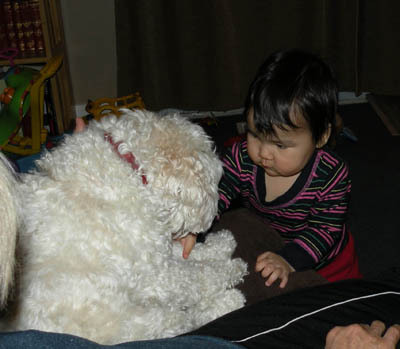 We were never worried that Lily would ever do anything to harm Dagny, ever. 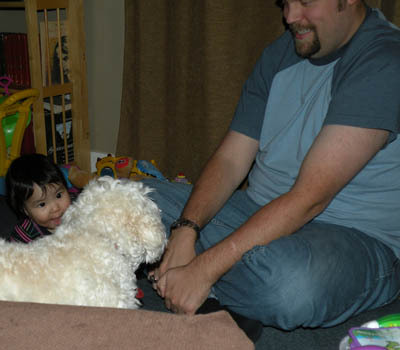 Due to Lily’s excitement when someone comes to our house we were a little concerned with how Dagny would react to having a dog trying to lick her from head to toe and run around her like she was a merry-go-round. 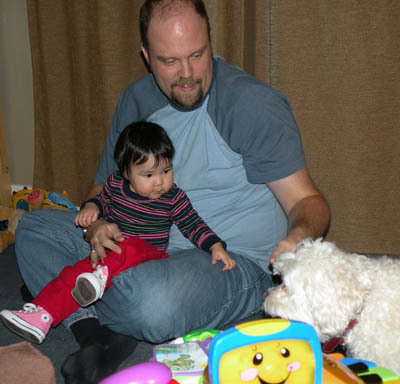 So when the day finally came for us to be home, yeah by the way, we were surprised that Dagny really didn’t mind Lily jumping and trying to lick her. 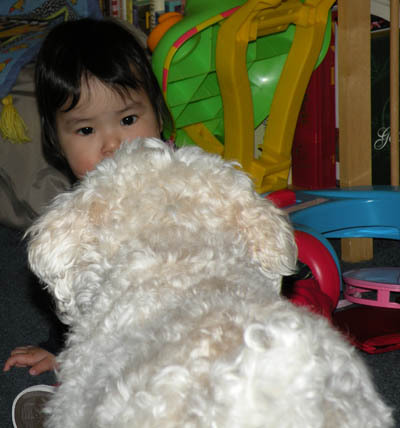 Now, if Lily tries to lick Dagny, she puts her head down as she crawls away from her and laughs. It’s one of the funnest things. Lily on the other hand is very much jealous of Dagny. We figured she would be because we perhaps babied her a little too much, but it so hard not to. But, that’s another blog. Dagny and Lily are not at the point where they play with each other. 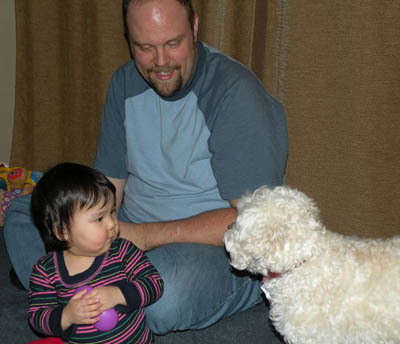 Dagny is still too young for that, but when Craig is around the three of them play together. That is such a cute site. They play fetch. 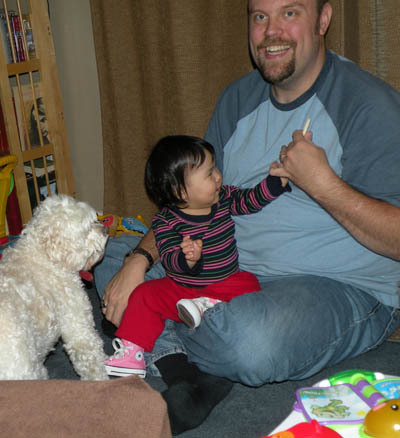 Dagny initially sits on Craig’s lap as Craig throws the bone and Lily runs for it. Dagny finds this hysterical. 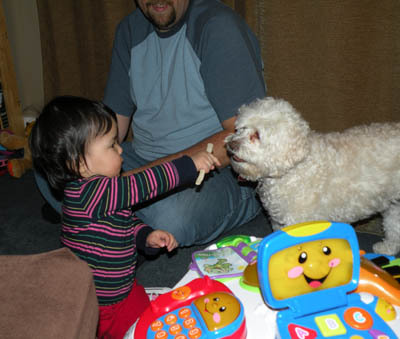 Then as time goes by Dagny tries to give Lily the bone, but of course Lily looks at her like, throw it, I want to run. Then when Lily doesn’t take it she gives it to Craig to throw. This goes on and on. As the game comes to an end it ends with Dagny patting Lily and Lily trying to lick her. It is the story of a girl and her dog. Maria on Hey, We’re Famous! Fran on Hey, We’re Famous!